Posted by Hillary Zhang on 1/16/2019 5:18:33 PM. Online file storage provider or cloud storage service is an Internet hosting service specifically designed to host user files. It allows users to upload files that could then be accessed over the internet only used by the user of the phone after a password or other authentication is provided. Storing files in the cloud has many advantages. You can view your files from any phone, tablet or computer that's connected to the Internet, and the cloud can also provide backup for files so they'll never disappear if your phone gets lost or your computer crashes. So it's very necessary to introduce some of the big names of free online file storage service to you. Cloud storage simply means a hard drive on the internet, a place to store your files and easily access them from any device, anywhere in the world. Let's take a look at the uses of online storage service. Personal file storage services are aimed at private individuals, offering a sort of network storage for personal backup, file access, or file distribution. Users can upload their files and share them publicly. Document-sharing services allow users to share and collaborate on document files. These services originally targeted files such as PDFs, word processor documents, and spreadsheets. However many remote file storage services are now aimed at allowing users to share and synchronize all types of files across all the devices they use. Content providers who potentially encounter bandwidth congestion issues may use services specialized in distributing cached. It is the case for companies with a major Internet presence. Online storage service has been one of the most popular topic in these years. Therefore, a lot of big companies, like Google, Amazon, Microsoft, start working on their own cloud storage service. Fortunately for you, we've rounded up the best 5 free online file storage to help you pick the one that's right for you. Google Drive is a file storage and synchronization service developed by Google. It allows users to store files on their servers, synchronize files across devices, and share files. 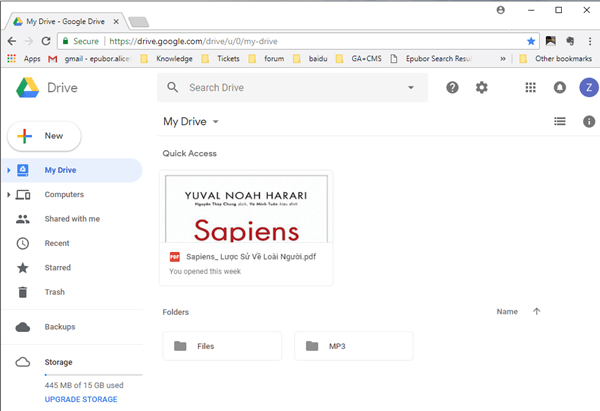 In addition to a website, Google Drive offers apps with offline capabilities for Windows and macOS computers, and Android and iOS smartphones and tablets. Google Drive encompasses a Google Docs, Sheets and Slides, an office suite that permits collaborative editing of documents, spreadsheets, presentations, drawings, forms, and more. Files created and edited through the office suite are saved in Google Drive. Google Drive offers 15GB of free cloud storage. If you need more than the 15GB of free cloud storage, for $1.99 per month customers get 100GB of storage, and for $9.99 per month customers receive 1TB of storage. 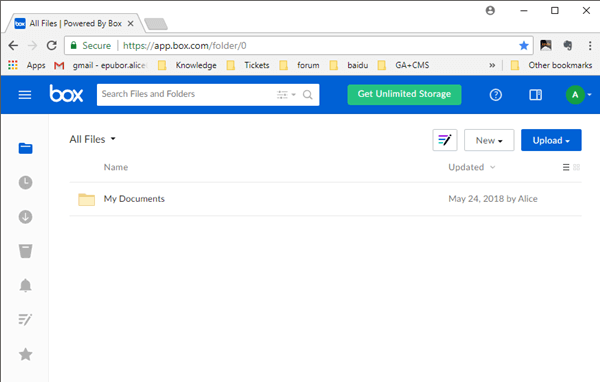 Box, winner of PC Magazine's Editors' Choice Award, is a cloud content management and file sharing service for personal accounts and businesses. This service is more of a business-collaboration and work-flow solution than a storage service. In addition, the business versions of Box include access to a variety of work programs, which are integrated with Box's cloud storage and services. Box is fast, secure and simple to use, so you can be productive from anywhere, which is the reason many businesses, including General Electric, P&G and The GAP securely access and manage their critical information with Box. It is available for Windows, macOS, iOS, Android, and Blackberry. The free package gives you 10GB of free space, but the upgrade is expensive, at $10/month for only 100GB of storage. 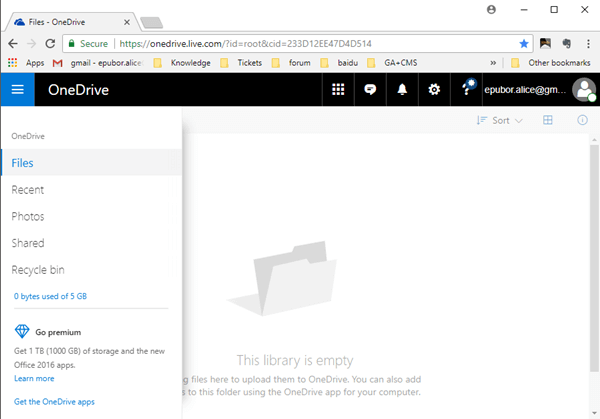 OneDrive is a file hosting service operated by Microsoft as part of its suite of Office Online services. It allows users to store files as well as other personal data like Windows settings in the cloud. Files can be synced to a PC and accessed from a web browser or a mobile device, as well as shared publicly or with specific people. It's the obvious cloud storage service for Windows users because it's built into Windows 10. OneDrive's biggest strength is that it works closely with Microsoft Office apps, such as Word or PowerPoint. OneDrive offers 5 GB of storage space free of charge. There are paid-for plans, of course, and you'll get 50GB of storage for only $1.99 per month. And if you sign up for Office 365 (as well as all of the other Office 365 features) for $59.99 per year, you get 1TB of space. 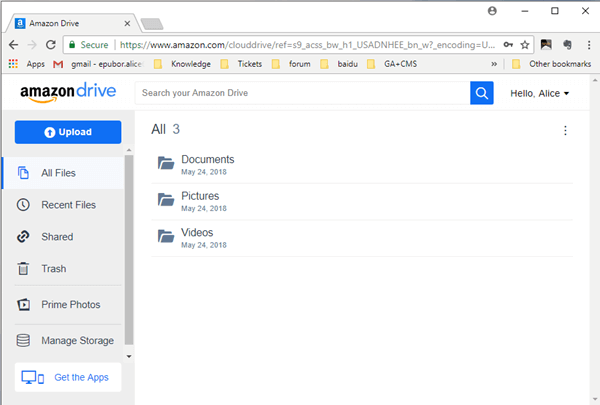 Amazon Drive is a cloud storage application managed by Amazon. It offers secure cloud storage, file backup, file sharing, and photo printing. Using an Amazon account, the files and folders can be transferred and managed from multiple devices including web browsers, desktop applications, mobiles, and tablets. Access all of your documents from anywhere, and share them with friends and family, without having to log on to your computer. All Amazon users receive 5GB of free storage. If you need more than 5GB storage, then for $59.99 per year you can have unlimited storage. Dropbox is one of the only cloud storage services to offer clients for Linux and Blackberry, alongside the usual Windows, macOS, Android and iOS standards. There's an official Windows Phone app too. Dropbox isn't the first cloud-based storage service, but it is the one that popularized it. 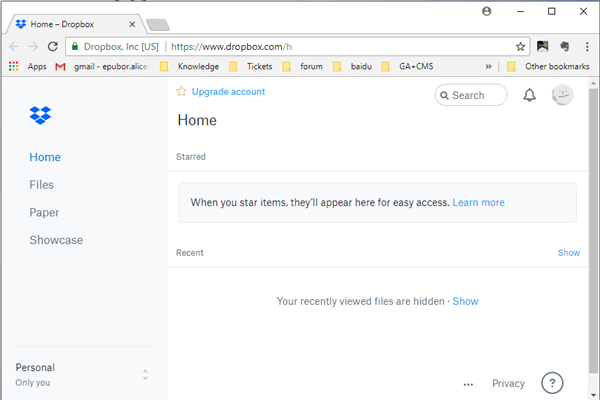 Dropbox can create a special folder on the user's computer, the contents of which are then synchronized to Dropbox's servers and to other computers and devices that the user has installed Dropbox on, keeping the same files up-to-date on all devices. Dropbox has received many praise, including the Crunchie Award in 2010 for Best Internet Application, and Macworld's 2009 Editor's Choice Award for Software. The free Basic account comes with a paltry 2GB of storage. You can upgrade to the 1TB plan for $9.99 per month. One of book lovers' biggest concern is how to free online backup an ebook library so it is safe and easily accessible after stripping the DRM from their ebooks. Then the ebooks stored online can be accessed from anywhere. With the above amazing cloud service which offer free storage, I believe you already have an idea about how to free cloud backup your non-DRMed books. But first thing first, you need a powerful DRM removal to decrypt the DRMed books. You may hear of Epubor software if you have ever tried to decrypt your DRMed books. Epubor Ultimate is the most powerful and easy-to-use eBook DRM Removal and eBook format converter. Fisrt of all, download Epubor Ultimate for PC/Mac to your computer. Tips: Epubor Ultimate can support ebooks purchased from mainstream ebook stores like Amazon/Google Play Book/Kobo/Nook, etc. Next, run Epubor Ultimate on your computer. And all of your purchased books downloaded via correspond desktop apps will be displayed in the left sidebar. Then you just need to add the books to the right mian window to remove DRM. Tips: Epubor Ultimate can automatically detect your downloaded books without adding them to the software manually. We have to admit that online cloud storage has greatly benefit our work as well as daily life. It provides us a secure place to back up our all kind of files, and gives us access to the content from anywhere with the desktop and mobile apps on iOS and Android, and share them with friends and family without having to log in your computer.